Just how similar is the armour of the T-15 to the T-14? As I understand it, the T-15 uses the same hull as the T-14 Armata except that it has its engine in the front - which would make it the best protected IFV right now if that's the case. The only way it could be improved is if it had a 60/57 mm hyper-velocity gun and two 23mm autocannons to accompany the Kornet EM missiles. Hull should be identical so in terms of physical protection it should the same. 23mm caliber is slowly fading from service so i dont think they would develop new platfom featuring that caliber. And two cannons would just make ammunition waste an issue and logistics would get messier. 57mm gun will come in future but from what i could figure it will be used on lighter tracked platfrom K25 and there will be AA variant. Excellent! Thanks, bro. I prefer the 30mm to the 23mm but it limits the amount of ammo that can be carried, and if the 23mm was just a secondary armament, I don't think that its ammo would be used all that much. I've never served so I don't really know. If there was already 57mm gun on it, there is higher chance of it having HMG + 30mm grenade launcher than another cannon, or maybe slaved 30mm cannon like 100/30 are on BMP-3/BMD-4. SDB can easily take down T-72 tanks. I'll be more than satisfied if they put a 57mm hyper-velocity gun on the T-15, but a 30mm sure would be nice. I just don't know if there would be enough space for 30mm rounds in a turret already hosting 57mm rounds. max steel wrote: SDB can easily take down T-72 tanks. SDB is a 100+ kg munition. Hitting from zenith, it most likely will cause harm. So yeah...it can take down pretty much anything on that circumstance. Well 57mm guns shall be stored inside the hull i belive and i imagine secondary weapon would have shells stored externally. I am just speculating ofc. Wouldn't that put the crew in unnecessary danger? I think that an unmanned turret bustle is where the 57mm rounds should be placed. You could then put 23mm (or 30mm) cannons on the side of the turret. I read that the T-15 holds 7 dismounts but I expected it to hold up to 9 dismounts in addition to the crew of 3. It should have enough space considering that it doesn't have a manned turret or weapons in the hull. The front profile of the T-15 is a bit unusual, so why exactly is it like that? This acronym should stand for ? Small Diameter Bomb ? 1) I truly do not understand what should be the point of this note in the particular debate in course. The GPS aided gliding bomb in question has is niche of employment as weapon against small size not reinforced fixed structures ; moreover not only its very low speed and dependence from satellite in-flight correction render its kill chain one of the most frail among any relatively modern air to ground ammunitions ,both against EW and SHORAD, but its low potential warhead and CEP (in the same league of JDAM and similar) render it, even in its latest iteration with terminal IR homing, totally unsuited for the engagement even only of unarmoured semi-mobile systems (such as legacy SAM adn radar system with transition times ij the order of 30-40 minutes) except some random target of opportunity. Against heavy armoured targets ,such as MBTs, those negative features are even more exacerbated because the range of suppression of the detonation of a non HEAT warhead such as that of a SDB would be barely perceived by even a vastly outdated specimen. This was one of the main reasons for the horrible attrition results achieved by the fixed wing branch of Coaltion Air Forces ,with theirs JDAM, against Iraqi armoured formations. The idea was a hit right on with the GBU 39/1-2. Right on the GBU would go straight through the engine deck and explode. Or hit heavily on the turret and repaint it black and red. No one is going to use the SDB's on heavy AFV's moving. They have Submunition elements for that. On top of all the rest. Re. the 57mm. On the current module, the ammo is stored externally, with a small column that protrudes into the PAX compartment. Obviously this is Kurganets, but it should be similar on the T-15. Would comment on the 30mm vs 23mm question. First to be clear the 30 x 165mm ammo is a much more powerful round than the 23 x 114mm round. The 30 x 165mm round is a high velocity round effective in anti armour and HE use, and the 23mm round is like an enlarged 14.5mm HMG round with a much smaller shell case with much lower velocity. The 30mm would be best as a high velocity anti armour weapon as used on BMP-2 and BMP-3, but current and near future NATO IFV wont be penetrated by 30mm from effective battlefield ranges so the shift will have to be up to 57mm calibre weapons. Now the 57mm cannon shells are huge so it will mostly be used for anti aircraft and anti armour use... so what do you use against enemy infantry or soft ground targets? A 23mm cannon is a low velocity round with a small compact case so you can carry lots of rounds but the HE projectile is rather heavy and effective so it would be useful as a replacement for a 14.5mm HMG against soft targets... its 23mm HE shells being much more powerful because of their extra weight and size. Note the 23mm Shilka and ZU-23 round is a completely different round with a high velocity 23 x 152mm shell that takes up more space... the HE projectile is the same however so it is effective but gets there slower. 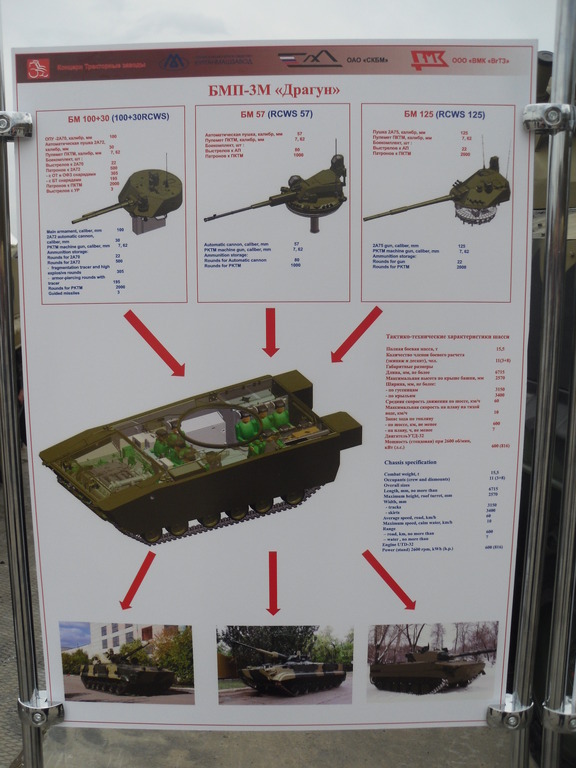 Note the Mi-35M2 with the 23mm chin turret uses 23 x 114mm rounds and it would make sense to replace the 14.5mm guns in IFVs and APC with this 23mm round as its HE effectiveness is excellent with a small compact low recoil round. External magazines are quite small compared to what i expect from IFV armed with 57mm gun, so i think they will have hull penetrating ammo bustle. Especially if they plan on using it as secondary AA system. They might be able to get by, if they use 57mm missiles for AA. I think it was KBP who developed the missile, but IIRC their product had a 80% Pk. at 8km with a two round salvo. So even with 20 missiles, that would be ~8 dead targets @ 8km. This was an older system, and today they can probably get more reach through stabilization and auto tracking. The current AU-220M, the newest 57mm system carries 80 rounds and doesn't penetrate into the hull. Here we go, I found a shot of the naval version of the AU-220M. So there is a real version that has a basket magazine. Who knows, this could end up on the T-14. I didn't realize just how far back the turret was on the T-15, their only option may be the 80 round roof magazine system. Do not forget that major work was carried out by national experts and in the other direction - the creation of a gas turbine power plant, significantly increases the speed armored cars. Experts note that GTD implementation of this technique in a difficult task, however, with the right level of attention this issue is quite capable to solve. As experts explain, GTE should be further developed for the power supply system to the specific fuel consumption was comparable, and was lower than the diesel powerplant. It is also possible adaptation of another type of power plant - a hybrid engine. By the way, this technology is already implemented in the metal - experimental armored car "Krymsk" based on the BTR-90 already uses a hybrid propulsion system with a specially designed electric transmission. ...Gas turbines for AFV's by themselves are gas guzzling 'gold-plating', but combined with diesel engines you have both superior fuel consumption, acceleration but you'll also likely to have the ability to run your AFV's on relative 'silent' mode, and theirs also the future development of electric armor. Indeed, a modern day equivalent to the ZVERABOY (Beast-slayer) of the Great Patriotic War. The advantage of gas turbines is they are small and compact for the power they produce, and when they are connected to a dynamo to generate power rather than a transmission to generate torque they have excellent fuel efficiency. It is when they are used to shift a 40+ ton tank around the battlefield that they become inefficient because most movements by a tank on a battlefield are short high acceleration bursts of speed from a position of cover and protection to another position of cover and protection most of the time... this is very fuel inefficient for a gas turbine. If you instead run the gas turbine at optimum speed generating the max potential electrical current then rapidly accelerating from one place to another using electric motors is vastly more efficient and effective.... and quiet. Regarding the 152mm gun armed armata, this is the MBT version, not the heavy artillery version, which would be coalition. 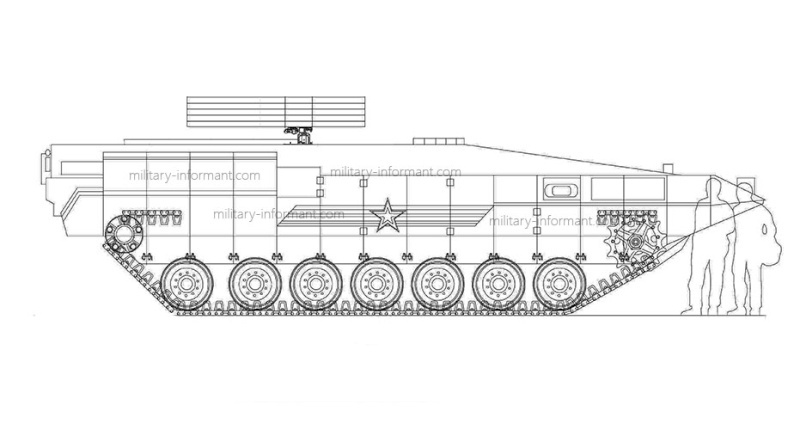 This would be a direct fire anti obstacle and anti armoured vehicle system so the ISU-152 analogy would be accurate except its sensors and optics would mean it has every advantage in sighting and target detection as any enemy MBT. JSC "Instrument Design Bureau" together with the designers of the universal combat platform "Armata" started to develop a universal missile system capable of performing the task of destroying armored vehicles, manpower low-flying enemy targets, as reported by its own power military-informant.com portal. The new missile system placed on the crawler combat vehicle Armata will combine the capabilities of operational-tactical complex, multiple rocket launchers and anti-tank complex. 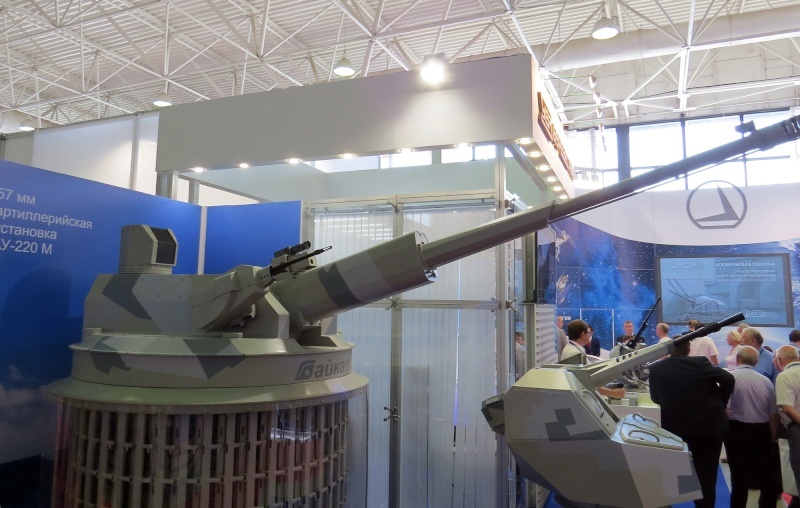 On the basis of the chassis will be available with a universal launcher class "surface-to-surface" missiles and "surface-to-air" in special military transport containers. The composition of promising missile system will include armored launcher and machine guidance system and reconnaissance on the battlefield. A fundamentally new missile system will be able to interact with all modern weapons and obtain intelligence information from aerial surveillance, ground-based reconnaissance and other combat systems on the battlefield. The new missile system based on the Armata platform designed to engage single and multiple targets, including tanks, engineering and fortifications, surface targets and low-speed flight vehicles at distances up to 145 km. It is assumed that the Ammunition of the new missile system will be about 20 ready-to-launch missiles for various purposes. Since it's KBP, and given the wide target envelope, I'm assuming they're referring to Hermes. Gur Khan: predictability. Speech in this case, all of the same contract for 100 units, as previously reported. Some felt that the contract relates only to the T-14. But this is not the case. It applies to all cars on the "armatovskoy" platform: tanks, infantry fighting vehicles and ARV. According to my estimates personally, I ordered something about ARV 10 T-16, T-60 tanks and 14 BMP-30, T-15. Naturally, there is not exactly 100 cars, and a little more - and still BMP probably go battalion sets. It seems order for 100 Armatas is not only for T-14 tanks. They ordered 60 tanks T-14, 30 heavy BMPs T-15 and 10 BREM T-16. I don't know how accurate that image is but if I recall right the max range of ground based (with the additional booster rocket stage) was 100 km not 145 km. It could be that they improved the range of Hermes, but 145 km sounds similar to the range of Tornado-S which would be much longer/larger than the munitions shown in the graphic. But at the same time I've never heard of MLRS capable of engaging low-flying speed aircraft, so this may actually be an improved Hermes. Speaking of MLRS, what's the possibility that Hermes could an additional munition added to Smerch/Tornado-S MLRS? With the booster stage, Hermes is 210 mm in width, and 3500 mm in length, while Tornado-S is 300 mm in width, and 11.2 meters in length, so in theory 1 per tube can fit for a total of 12...however this isn't ideal, instead they (KBP-Tula) should create modified version of Hermes that reduces both stages from 170/210 mm, down to 150 mm (both stages conforming) with each stage lengthened to counterbalance the shortened diameters of stages. That modified configuration will give you 4 Hermes per tube (4x12) giving you a grand total of 48 Hermes longrange top-attack ATGM's. I think that they refereed to it as MLRS simply because of aesthetic similarities between launchers. This thing (if the news is accurate) will definitely use guided missiles similar to Khrizantema on BMP-3 just with lot more of them. Makes sense, unit commonality was core principal behind the whole concept. "armatovskoy", interesting term, i am suprised its not "Abramovski" or "Aramamski", "Sidevindorski", those are terms they always loved to use.